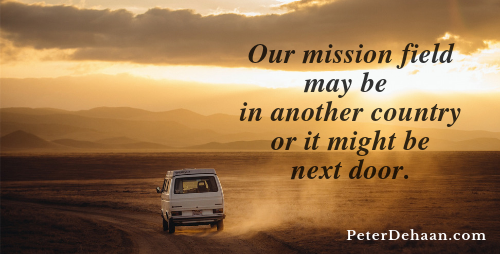 Where is Our Mission Field? Where Should We Go For Jesus? HomeBlogThe BibleWhere Should We Go For Jesus? Where Should We Go For Jesus? Where Is Our Mission Field? Before Jesus returns to heaven, he tells his followers to go throughout the world and let others know about him (Matthew 28:19). Does that mean we’re all supposed to travel to a distant country for Jesus? Is that their mission field? It could be, but it might not. Consider a different account, one where Jesus gives an alternate instruction. The demonic influence is now gone from the man. In his right mind, and likely full of gratitude, the man asks if he can hang out with Jesus. Jesus says “sure, why not . . .” No, that’s not what Jesus says at all. In both accounts Jesus tells his followers to go. One time it is to go to all nations and the other time it is to go home. While our mission field may be in a foreign country, it might also be in our own home or right next door. Discover more about the Book of Luke in Dear Theophilus. Get your copy today.